Clare brushed aside Louth at Cusack Park, Ennis, yesterday. A half-time lead of 3-7 to 0-6 in favour of the hosts left Louth with a mountain to climb in the second half and though they did outscore their opponents 15 to 0-5 in that period, the Clare victory was cemented before the break. 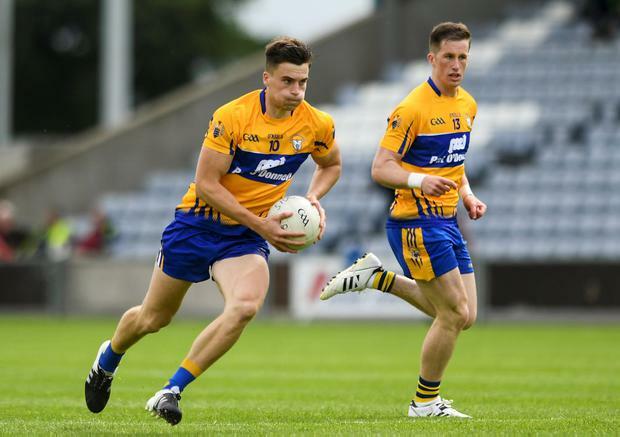 Colm Collins, the Clare team boss, expressed his satisfaction with the victory and maintenance of divisional status, saying: "You got your two points. "Like every game you play, there are things you wouldn't be happy with, but two points gained and eight overall, so we are safe on our own bat." The home side got immediate results from the thrown-in. After a foul, a quickly-taken free taken by Gary Brennan found Jamie Malone on the edge of the Louth square.Malone made no mistake from close in after just eleven seconds of play. Clare were 1-4 to 0-3 ahead on seventeen minutes. They snatched a second goal on the half-hour when Keelan Sexton palmed into Craig Lynch's net, after being set up by Malone and Eoin Cleary. A third came at the start of time added on, Kieran Malone goaling. Louth resumed the second half with positivity. They scored a goal and a point in a two-minute spell. Tommy Durnin slipped the Clare defence before deceiving goalie, Eamonn Tubridy, and Andy McDonnell rifled over the Clare crossbar to leave it 3-7 to 1-7. Pete McGrath's men, who prop up the Division 2 table and face the prospect of Division 3 football next season, missed scoring opportunity after scoring opportunity all day. Scorers - Clare: E Cleary 0-8 (6f), K Malone 1-2, J Malone, K Sexton 1-0 each , C O'Connor, C Finnucane 0-1 each. Louth: T Durnin 1-1, D Byrne, A McDonnell, T McEneaney 0-2 each, B Duffy, R Burns (f), C Grimes, R Nally 0-1 each. Clare - E Tubridy 7; C O'Dea, C Brennan, A Fitzgerald 7; S O'Donoghue 7, P Lillis 7, J Malone 8; G Brennan 7, C O'Connor 8; K Malone 8, E Cleary 7, S Collins 6; C Finnucane 6, K Sexton 7, D Tubridy 6. Subs: C Ó'hAinifein 7 for Fitzgerald (H/T), G O'Brien 6 for Finnucane (H/T), C Russell 7 for D Tubridy (44), D Bohannon 6 for G Brennan (56), A Sweeney for Collins 6 (58), E Courtney 6 for Sexton (65). Louth - C Lynch 7; F Donohue 7, E Carolan 6, J Craven 6; E Lafferty 7, B Duffy 7, A Williams 7; T Durnin 7, D Byrne 7; D Maguire 6, A McDonnell 7, G McSorley 6; R Burns 6, C Grimes 7, W Woods 6. Subs: R Nally 7 for Burns (30), J Stewart 6 for Craven (53), C Downey 6 for McSorley (53), T McEneaney 7 for Woods (53), R Holcroft 6 for Maguire (65).